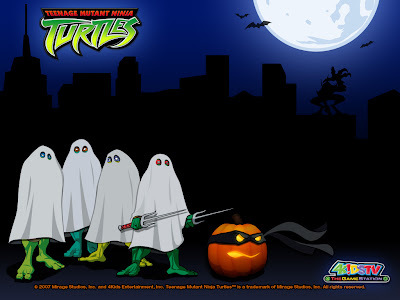 To celebrate this spooktacular holiday, here's a desktop wallpaper I swiped off of 4kids.com. Mauro sent in this great picture of himself and his girlfriend from last Halloween. He reports that they'll be wearing the same costumes again this year. 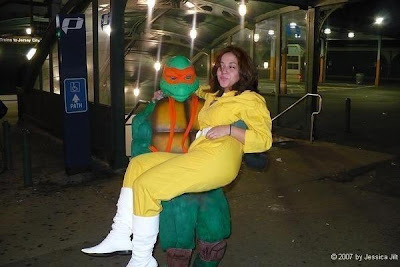 Anyone else have any TMNT Halloween pictures to share? 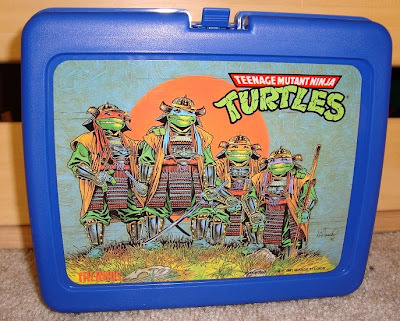 A while ago I featured a TMNT lunchbox with Michael Dooney art that's part of my non-collection of lunchboxes. Today I've decided to feature the A.C. Farley lunchbox. Although the lunchbox is copyrighted 1991, it seems to be obviously inspired by the third movie. Copyright dates aren't always 100% reliable, so it might have been a tie-in to the movie. I personally don't recall seeing this one in stores, only on the mighty eBay. But it's awesome and I love it. I'm not aware of this piece of art being published anywhere else, though I welcome people who would like to inform me otherwise do so. Oh, and speaking of the mighty eBay, I have a duplicate of this box up for auction right now! Hmm... lack of updates recently it would seem. Why? Well, the honest answer is that I've lost all enthusiasm for the TMNT in their current state and form. Unfortunately, that's no exaggeration. My lack of enthusiasm is at a solid 100%. I have totally and completely given up on Mirage Studios and all "partner" companies in their efforts to run the TMNT franchise. "Things are not good in turtle land, sorry to report. But Wal-Mart has decided to drop TMNT from ALL its stores beginning in the Spring!" The implications of not being carried at Walmart go deeper than the simple lack of toys on Walmart shelves and pegs. Walmart is the nation's largest retailer and they have a HUGE influence in the market and trends across the board. Not being carried at Walmart means Playmates probably just lost half of their orders. Can Playmates sustain itself on half the quantity of what few products they're already producing? Not likely. And even if they can, it's not unreasonable to expect other retailers to follow suit with Walmart. 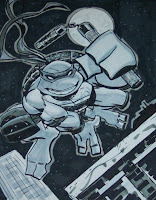 So that brings us into 2009, the big TMNT 25th anniversary "Shell-abration" year, with minimal product to support it. Sounds like an awesome party to me. This problem goes beyond just toys, though. 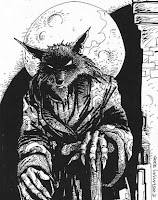 Peter Laird has recently stated that there are no current plans for a TMNT cartoon beyond 2009 and at this point in time the future of TMNT comic books beyond 2009 also remains in question. That means we'll be having a Shell-abration for the past 25 years of TMNT with absolutely no certainty that there'll be another 25 years. Given the amount of money Mirage is supposedly spending to Shell-abrate, it may not be the best investment of money. There is supposedly a movie company *this* close to inking a deal with Mirage for some sort of "hybrid" movie (I love how Mirage calls it a "hybrid" movie as if they came up with the concept of mixing live action with CGI). I wouldn't count on that happening if there isn't a connected toy deal. And if Playmates can't get TMNT product into Walmart, there isn't likely to be a toy deal. Honestly, no matter what the circumstances are with toys and other related products, that company should just take their money and run away. Run far, far away. Mirage is a dying company, and it's time to just let it do so instead of putting off the inevitable that much longer. They are a company that is only interested in making the quick and easy buck by signing a deal with a licensor who wants to put TMNT images on their products. They are not interested in actually investing time, effort, or (god forbid) money in creating a foundation with which to support those products. 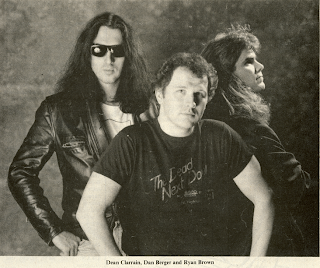 CEO Gary Richardson has a history of making shading licensing deals and making questionable business decisions. His earnings are apparently directly tied to the income generated by the Mirage Licensing division, so he goes for the quick buck and rejects anything that would involve the actual spending of money, be it printing costs for the books Mirage should be publishing next year but won't be or the cost of more employees so that people might actually be able to focus on delivering on what the fans want to see. Oh, and speaking of the fans (that is presumably you, dear reader), I hope you have recognized that Mirage and all related companies have been doing nothing but giving you the proverbial finger more than a year now, if not several. It's time to let it die. It's ok. Really.